Billionaire businessman Patrice Motsepe took the unusual step this week of calling a press conference to deny rumours that he would benefit in any way from Eskom’s asset sale. But though such claims are clearly being used as ammunition by conspiracy theorists and critics of President Cyril Ramaphosa, the fact remains that it is legitimate – and indeed necessary – to keep an eye on the business activities of President’s former colleagues, friends and family members. Patrice Motsepe will be the first to admit that his links to political power in South Africa sometimes seem too close for comfort. The billionaire businessman did exactly that during a press conference he called this week. “Having relatives in very high positions in government justifiably raises perceptions of favouritism or improper conduct,” Motsepe stated. Motsepe was referring to the fact that he happens to have two brothers-in-law in the current Cabinet. One is President Cyril Ramaphosa, who is married to Motsepe’s sister Tshepo. The other is Energy Minister Jeff Radebe, who is married to Motsepe’s other sister, Bridgette. None of this is news. Motsepe was spelling it out explicitly, however, because his familial ties have become the subject of renewed interest in light of the planned unbundling of Eskom. There’s a necessary caveat here. 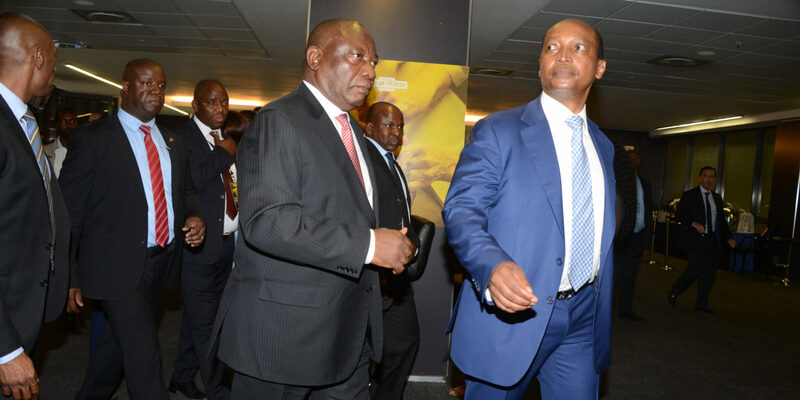 Motsepe’s familial ties have become the subject of renewed interest to certain sections of South African society – which by and large has failed to include the mainstream media. With South Africa having barely survived a period where the President of South Africa grotesquely abused his position to ensure the enrichment of himself and his businessman friends, you would think we would all be in a heightened state of paranoia when it comes to crony capitalism. But that doesn’t really seem to be the case. It is largely the EFF and its followers on Twitter which have been darkly gesturing at Motsepe as a potential beneficiary of the plans to unbundle Eskom. And while the topic of Eskom has become a rich playground for conspiracy theorists – who should read Dirk de Vos’s painstaking debunking of some of the myths around the parastatal – the EFF is, in principle, not wrong to draw attention to potential conflicts of interest. Motsepe confirmed on Monday that his African Rainbow Energy and Power (AREP) has skin in the renewable energy game, but pointed out that his company’s share of the Department of Energy’s Renewable Energy Independent Power Producer Procurement programme amounts to less than 10% of government’s total investment. Motsepe is a shrewd businessman, and from that perspective, there is nothing surprising about his foray into renewable energy as one of the key industries of the future. His investment in the industry also predates both Radebe’s appointment as Minister of Energy and Ramaphosa’s ascent to the presidency. Ramaphosa, meanwhile, inevitably has close ties to big business beyond Motsepe as a result of the almost two decades (1997-2012) he spent focused on his business empire rather than politics. But even if every aspect of the government’s recent contracts with figures like Motsepe is beyond reproach, public response to these developments has largely been curiously blasé. When President Ramaphosa announced his Eskom Sustainability Task Team in December 2018 – a group of eight energy hotshots tasked with “advising government on actions to resolve Eskom’s operational, structural and financial challenges” – he included among them Brian Dames. Dames had obvious expertise in this area as a former Eskom CEO, but since 2015 has also served as the CEO of Motsepe’s AREP. The optics of Ramaphosa selecting the boss of his brother-in-law’s private energy company to advise Eskom on how to fix its energy problems are, to say the least, strange. Within days Dames had resigned from the task team, citing “perceived” conflicts of interest. This was to Dames’ and Motsepe’s credit, because there was little evidence of any particular uproar from either the public or the media over the appointment. One day before the Presidency’s announcement of the team’s composition, Bloomberg had reported that Eskom was in “advanced talks to sell its home-loans business, with local billionaire Patrice Motsepe’s African Rainbow Capital (ARC) in line to take some or all of the operation”. The report made no mention of Motsepe’s ties to Ramaphosa. And while that indeed might be the case, it’s worth considering what the response would have been like to the news that Eskom was to be unbundled if President Jacob Zuma was still in power and his family member had previously been reported as sniffing around Eskom’s component parts. Ramaphosa is not Zuma, and thus far has shown promising signs of charting a different path to his predecessor. But that doesn’t mean that we should all entirely abandon our vigilance when it comes to relationships between government and Ramaphosa’s possible cronies. To give one further example, relatively little attention has been paid to the fact that the Total discovery of a gas field south off Mossel Bay – which Ramaphosa and Mineral Resources Minister Gwede Mantashe expressed delight about, against the reservations of environmentalists – stands to benefit just one South African individual, businessman Phutuma Nhleko, to the tune of potentially hundreds of billions. Nhleko has enjoyed a very close business relationship with Ramaphosa in the past – as evidenced by the fact that he took over the assets of Ramaphosa’s Shanduka company when Ramaphosa became South Africa’s deputy president. Nhleko has recently also been implicated in a corruption case dating back to his time as an MTN executive, involving a multibillion-dollar deal between Iranian authorities and MTN. The allegedly corrupt contract also took place at the time when Ramaphosa was serving as chairperson of the MTN board. In a column on the matter, News24 editor Adriaan Basson wrote that we should be alert to the possibility that the Hawks investigation may be part of a (seemingly very real) factional challenge to Ramaphosa’s presidency. Basson is correct: We should be alert to that possibility. But it also cannot be the case that we reflexively dismiss corruption investigations involving Ramaphosa on the grounds that he is vocally anti-corruption. If journalists had extended the same benefit of the doubt to former president Jacob Zuma, South Africa would be in a far worse situation right now. Again, Ramaphosa is not Zuma. But a sense of relief at having emerged from the Zuma years should not blind us to potential conflicts of interest, favouritism or corrupt associations involving the Ramaphosa presidency.